Did you know that Magic is 25 years old? You probably did. 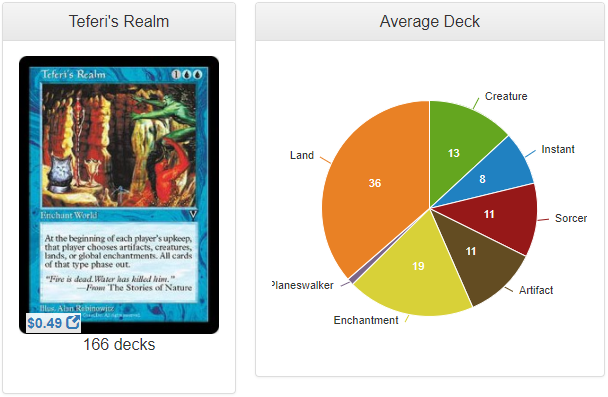 But are you familiar with very many cards more than a decade old? Maybe you aren’t. 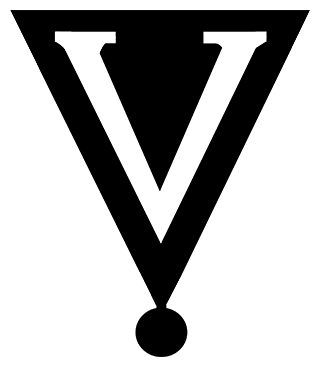 Today I’m going to reacquaint you with a set 20 years in Magic‘s past: Visions! Visions is a small set from Mirage block that used the mechanics phasing, flanking, and cumulative upkeep. But just because it’s a small set, that doesn’t mean there is a small number of underplayed, awesome cards in here. This set is so old that new EDH players don’t even know to look in here for cool cards, and there is quite a wealth of excellent effects. Pull out your shovels, kids. It’s time to dig into Visions. Peace Talks sees play in 39 decks. This card is such a weird lockout piece. In regular 1v1 magic, this card stops you and your only opponent from targeting or attacking each other. In multiplayer, your position at the table matters. You want to be next to the player with the big board of beaters who’s threatening to barrel over the whole table on her next turn. Or you want to be next to the captain of targeted removal who really wants to get rid of your stuff. Either way, this card won’t affect you because you can attack and play out all of your targeted spells before you cast this! Having a flash enabler makes this card extra dirty because you can get to lock two opponents out instead of one. Phelddagrif, the queen (or king?) of group hug, plays this card the most at four decks. Playing this in something with few creatures like Shu Yun, the Silent Tempest, Zurgo Helmsmasher, or an early game Kaalia of the Vast, can keep you from taking a nasty hit from an annihilating Eldrazi titan, in addition to keeping your commander safe from those pesky spot removal spells. 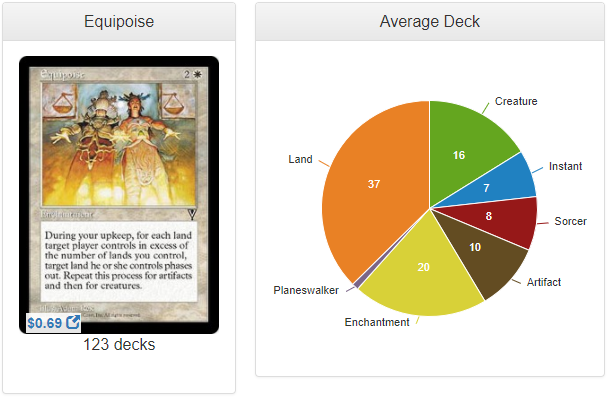 Equipoise is a repeatable board parity effect that sees play in 123 decks. To understand it, we need to understand phasing a little bit. Phasing is…weird. Phased out cards do not exist, but they haven’t left the battlefield, and they won’t enter the battlefield when they phase in. Permanents always phase in at the beginning of their controller’s upkeep, and creatures that phase in this way won’t have summoning sickness because they’ve continuously been “on” the battlefield (like I said, weird.) Also, any permanents attached to other permanents that phase out also phase out and back in still attached to those permanents. When a token phases out it ceases to exist, and any permanents attached to that token do not phase back in since the permanent they phased out with no longer exists. So. Equipoise equalizes one opponent with your board state until their next upkeep unless they’re playing tokens. Then they’re going to lose those tokens forever. Equipoise doesn’t target (oracle text), so you can hit permanents with hexproof and/or shroud. If you hit the player to your immediate right, they’re going to miss out on their permanents for a whole wheel of the table. 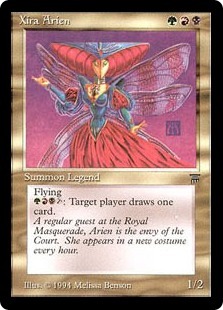 Narset, Enlightened Master, the meanest voltron/combo commander ever, plays this card the most at 10 decks. 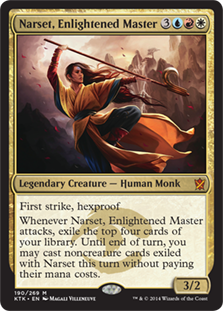 Narset is all but guaranteed to have only one creature, so Equipoise can choose one player and get rid of everything but their worst blocker. Anything else that gets removed this way is just gravy. This card is also great for an Atraxa, Praetors’ Voice superfriends deck. Sram, Senior Edificer, Bruna, Light of Alabaster, and Akiri, Line-Slinger all tend to run very low creature counts, allowing you maximum anti-creature phasing. Undo is a double creature bounce spell that sees play in only 41 decks. While it isn’t exactly Reckless Spite or Ashes to Ashes, it also doesn’t have any restrictions on the types of creatures it can hit, nor will it cost you an eighth of your life. Sorcery-speed hurts it, but, as it’s a cheap two-for-one, it has a high potential to blow your opponents out. Especially if you run Leyline of Anticipation and Vedalken Orrery to give all your stuff flash. Aside from Whiplash Trap, which is only sometimes cheaper, this is the cheapest double bounce spell in blue. 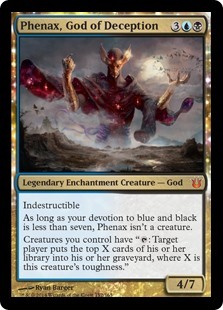 Phenax, God of Deception, the master of mill, plays this card the most at three decks. Now, Undo doesn’t have any special synergies with Phenax especially; it’s just a good removal spell. Try it in Shu Yun, the Silent Tempest, Talrand, Sky Summoner, Noyan Dar, Roil Shaper, or any other commander that cares about casting instants and sorceries. If it’s too slow, toss in a Quicken, and draw a card off of it for an extra blue mana. Teferi’s Realm is a political, soft stax card that sees play in 166 decks. This card makes all of your opponents scoop it up, read it and say, “huh?” This card is similar to Equipoise in that it takes away permanents for a wheel of the table or less, and then the permanents phase back in on each player’s upkeep. Stuff like this is useful for getting rid of really oppressive pieces that are holding the table down. If someone is playing hatebears, for example, or group slug enchantments, the Realm gets the table out from under Elesh Norn, Grand Cenobite or Painful Quandary. 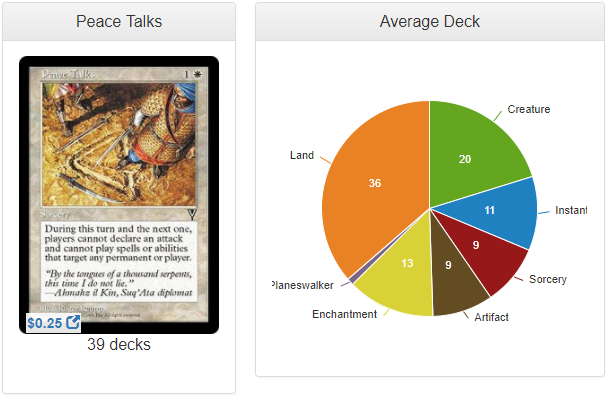 Do keep in mind that players can name a card type that has already phased out, essentially doing nothing. Also, keep in mind that some players find this type of card annoying and may target you just to get rid of it. 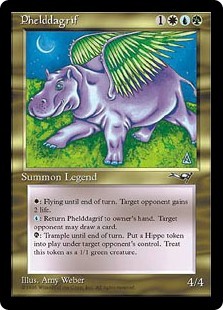 Jhoira of the Ghitu, who loves time magic, plays this card the most at 25 decks. She’ll phase everything out, lands, creatures, artifacts, whatever, as long as she has a fat eldrazi or extra time spell suspended. This is another good card for superfriends decks like Teferi, Temporal Archmage, since Teferi’s Realm doesn’t list planeswalkers as a card type it can phase out. Calling all non-creature combo players! 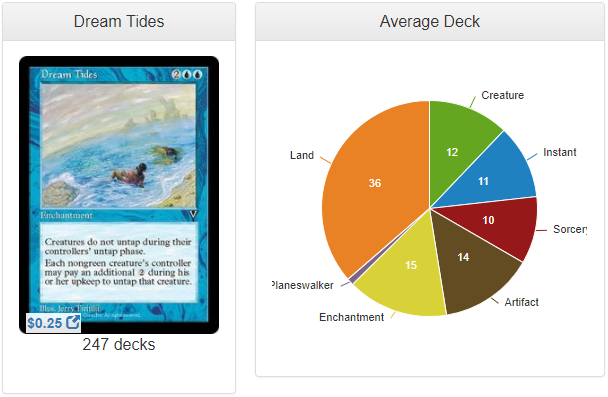 Dream Tides is a cheap lockdown piece that sees play in 247 decks and will take your mind off of your opponents’ problem creatures. If you run this in conjunction with cards like Kismet, Loxodon Gatekeeper, Thalia, Heretic Cathar, or Authority of the Consuls, your opponents are going to have a very tough time keeping any of their creatures up. If you are running creatures with this card, make sure to include lots and lots of vigilance enablers, Reconnaissance included. Narset, Enlightened Master, who should never have to pay to untap more than one creature, plays this card the most at 32 decks. Nekusar, the Mindrazer, Derevi, Empyrial Tactician, and Damia, Sage of Stone can all thoroughly slow down a board while incurring minimal downside for themselves. Commanders with built-in vigilance like Atraxa, Praetors’ Voice, Ojutai, Soul of Winter, and Roon of the Hidden Realm are also ideal generals to run Dream Tides. Roon and Ojutai, are especially good, as they have some added synergy with the card. 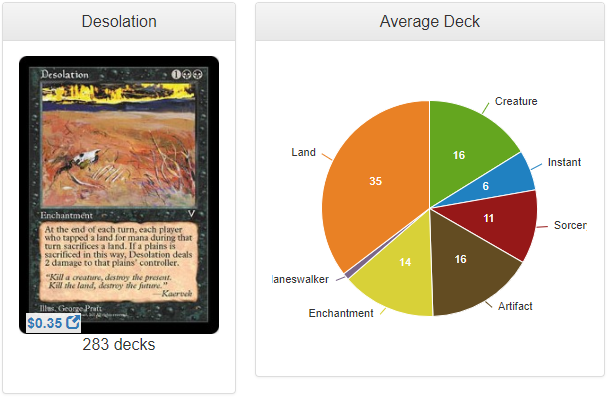 Desolation, which is a long-term punisher card, sees play in 283 decks. This card can potentially ensure that no one gets past their third land drop and punishes decks running a high density of instants especially hard. Now, your opponents can choose to just drop their land for turn and pass, slowly building up more and more resources without having to give anything up. This is highly unacceptable. To prevent this from happening, run Stoneshaker Shaman to leave them with no good options. They’ll have to sacrifice a land if they tap for mana, and they’ll have to sacrifice a land if they don’t. You will, too, but you planned for that when you built the deck, and are running lots of mana rocks or mana dorks in this deck to keep ahead of everyone else. Congratulations, your opponents hate you, but you’ve won the game. 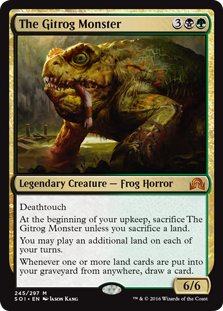 The Gitrog Monster, who was going to sacrifice those lands anyway, plays this card the most at 41 decks. Being able to play an extra land each turn, and probably running plenty of land ramping shenanigans, can keep you ahead of everyone else’s curve, and drawing a card off of losing the land doesn’t hurt, either. Kothophed, Soul Hoarder can draw a card each time your opponents have to sacrifice a land, potentially drawing you an extra card per opponent per wheel of the table. Sticking this in a Shattergang Brothers deck could lead to super high returns, as you can theoretically manipulate when this card is in or out of play. 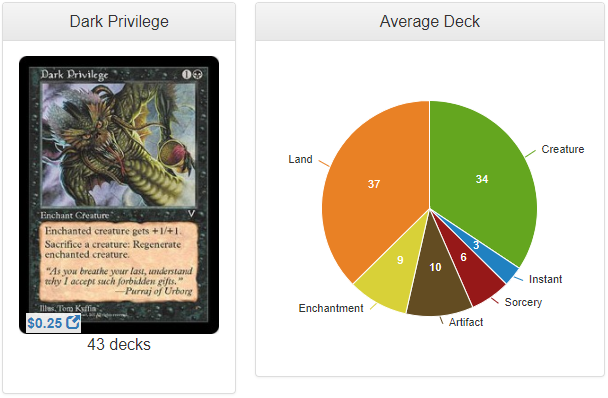 Dark Privilege is a free sac outlet that sees play in 43 decks. Playing auras is usually a bad idea, since it makes it easy for your opponents to two-for-one you. Privilege, however, makes it really difficult for your opponents to get rid of the creature it enchants. It gives the enchanted creature +1/+1 as a side bonus, and did I mention that it’s a free sac outlet?? Also, note that it doesn’t say that you have to sacrifice another creature. It’s not usually relevant, but being able to sacrifice any creature sometimes comes up. Like if your commander is being targeted by a Darksteel Mutation or Song of the Dryads, for example. 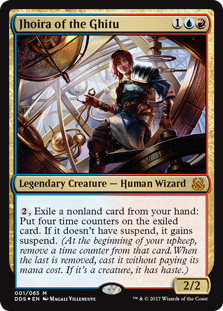 Shirei, Shizo’s Caretaker, who just brings back all of those sacrificed creatures at the end of the turn, plays this card the most at 15 decks. In fact, one of the main problems with Shirei is people removing him before the end of the turn. Dark Privilege does double duty in this deck, getting you the death triggers you need, and keeping Shirei on the board. This card is also great for commanders that make lots of tokens that can be sacrificed for value. Prossh, Skyraider of Kher, Sidisi, Brood Tyrant, and Kalitas, Traitor of Ghet all pump out creature tokens that can be chucked into the graveyard, allowing your commander to survive a board wipe or spot removal effect. 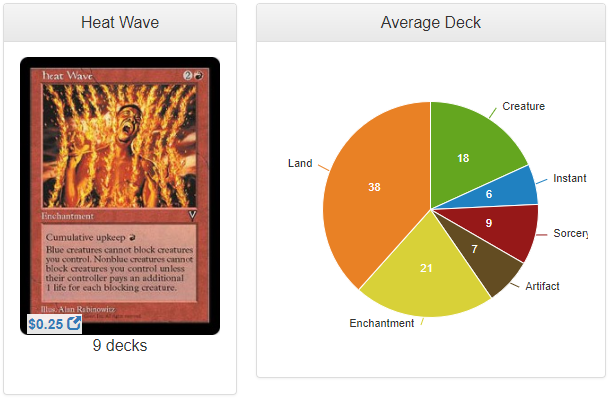 Heat Wave is an attack enabler that sees play in nine decks. The cumulative upkeep can get annoying, but it can be worth it to pay the cost for a couple of turns, as combat-oriented decks often only need a few turns to win. And hey, there’s always Braid of Fire if you really need it to stick around. When reading Heat Wave, you have to evaluate it based on the worst possible scenario, in which your opponents are not running any blue creatures, and just have to pay one life per blocker. That’s really not awful. It only gets better from there. 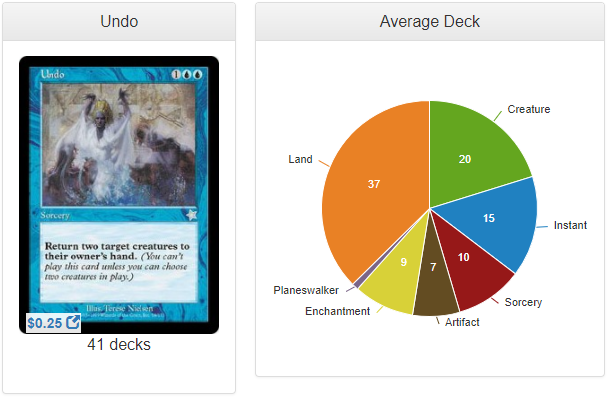 If you’re in a meta that’s heavy with blue commanders like Talrand, Sky Summoner, Jalira, Master Polymorphist, or Thassa, God of the Sea, your creatures are going to be straight unblockable. There are no top commander recommendations for this card since it is played in so few decks. This could be a good candidate for Grenzo, Havoc Raiser, or a punisher-style Saskia the Unyielding. Anything in red that needs extra ways to sneak damage through. Neheb, the Eternal might not care about paying the cumulative upkeep since he usually will just make all of his mana at the beginning of his post combat main phase. Quirion Druid is a roundabout land spot removal card that sees play in 38 decks. This card is a great, and somewhat mean, way to give your opponents surprise blockers, while simultaneously setting them back on mana. Hooray, politics! Running Quirion Druid with Seedborn Muse allows you to turn a land into a creature each turn, setting up for a nice boardwipe. Running this in a deck with blue will allow you bounce a bunch of lands with cards like Evacuation. If you’re running this in a Selesnya deck, you can literally just snipe your opponents’ lands by running Elesh Norn, Grand Cenobite. Jolrael, Empress of Beasts plays this card the most at four decks. This card is just backup for Jolrael; back up that doesn’t force you to discard any cards. You could run Quirion Druid in a The Gitrog Monster build, or maybe a Savra, Queen of the Golgari build that doesn’t mind turning those lands into a different kind of value. Elephant Grass is a green Propaganda lookalike card that sees play in 231 decks. Elephant Grass has the added bonus of completely preventing black creatures from attacking you at all, while still forcing all other creatures to pay a two-mana toll to attack. The cumulative upkeep is relatively cheap, but it can catch up to you. Make sure you pick up a copy of Solemnity to make Elephant Grass cost a single green with no upkeep. 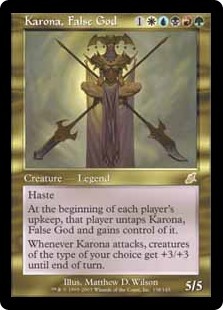 Karona, False God, who needs to protect her owner from herself, plays this card the most at 16 decks. Since Karona is black, she will never be able to swing back at her owner’s face, and will most likely swing at a different opponent much more deserving of her attention. Since Solemnity is such a good support card for Elephant Grass green/white commanders are probably the best place for this card. 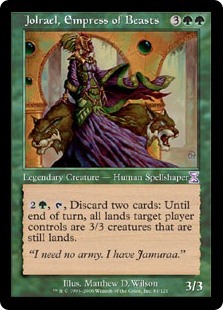 Drop is into Karametra, God of Harvests enchantress, Selvala, Explorer Returned combo, or Dragonlord Dromoka goodstuff. The benefit of this card being green is that you’ll probably never have an issue playing the upkeep cost if you need to. Seeing play in 73 decks, Mundungu is the counterspell that your opponents will never see coming even though it’s sitting right in front of them on the table. There are so many fun tax effects you can run this with, like Grand Arbiter Augustin IV or Spelltithe Enforcer in an Esper build, or Spellshock in a Grixis brew. Don’t neglect to run some untappers like Fatestitcher along with the best equipment in the game: Illusionist’s Bracers. 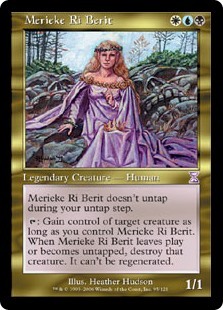 Merieke Ri Berit, the Esper master of tap/untap effects, plays this card the most at seven decks. I could see this slotting into an unorthodox Sedris, the Traitor King or Nekusar, the Mindrazer deck. Playing Mundungu in Kydele, Chosen of Kruphix with the black partner of your choice lets you double up on untapping synergies. 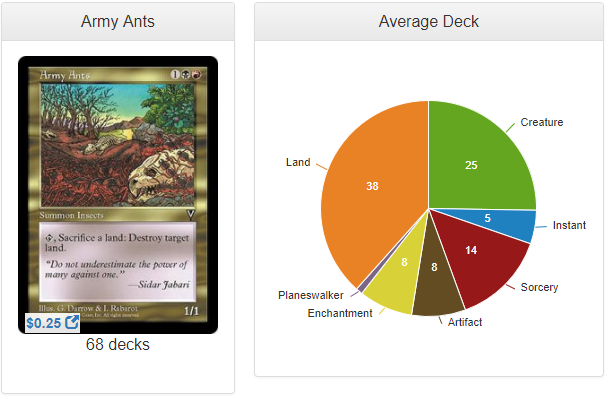 Seeing play in 68 decks Army Ants turns one of your lands into a Strip Mine per wheel of the table. Being able to sacrifice a land that’s already been tapped is an added benefit as it doesn’t slow down your mana production. Generally, your opponents are not going to want to burn a kill spell on a three-mana 1/1. If they do, you can think of Army Ants as a counterspell that kept them from blowing up your big threat, like maybe Prossh, Skyraider of Kher. Make sure you run mana rocks, mana dorks, and maybe Cryptolith Rite to keep your deck running smoothly. This week we’re going to feature Desolation in my very own Mogis, God of Slaughter deck. This is full party mode, suicide Rakdos fun. This deck drops some super fun, damage-dealing enchantments and then locks the doors by blowing up lands and preventing lifegain, so people can’t leave the party. This deck loses as often as it wins (or more often even), due to the heavy symmetrical damage-dealing effects, the complete lack of creatures, and abundant life payment effects. People tend to not like their lands blown up and a bunch of nasty damage effects smacking them every round, but what can you do? There’s no accounting for taste.